We are pleased to announce that the Petco Foundation has chosen to award a grant to the Animal Protective Association of Missouri. The grant will support our Pet Partners program, a door to door community outreach program designed to keep people and their pets together and reduce the number of pets entering local animal shelters. 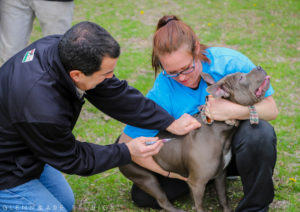 The services provided through this program include free spay and neuter surgeries, vaccines and microchipping and supplies such as leashes, collars, doghouses, and flea preventative if needed. Pet Partners serves the entire 63136 zip code, which includes the underserved neighborhoods of Castle Point, Bellefontaine Neighbors, Ferguson, Jennings, and Dellwood, where resources for pet owners are limited. It isn’t easy for pet owners when vet care, pet supply stores, grooming, and training isn’t accessible due to limited financial resources, lack of transportation or issues like not having more than one veterinary clinic located within a reasonable driving distance. We know that socioeconomic status doesn’t define how much you love your pet and likewise, income level doesn’t determine whether or not you deserve the companionship that pets provide, which is why we created out Pet Partners program to provide the resources these communities need. Thank you, Petco Foundation, for your support! Header images courtesy of Lynn Terry Photography.